The history of Rassilon is bloody. From the frozen far north, beyond the civilized lands with their rolling hills and forests, arose a mighty army of frost giants, ice devils, Hellfrost dragons,and fearsome orcs, servants all of the ice god Thrym. So began the terrible Blizzard War and the downfall of the mighty empires of man. Five hundred years later the races of the southern lands may have won the war, but they suffer its legacy still. For five centuries the winters have grown steadily longer and colder. Huge swathes of the land of Rassilon are permanently covered in ice and snow, and even the temperate lands are not spared the misery of failed harvests deadly winters, and the dreaded Hellfrost wind. But winter is not the only danger. A mere 30 years ago, magic, once the civilized races' most potent weapon, suddenly began to fail. The Siphoning an effect of unknown origin, has made magic an unpredictable ally. Welcome to the world of Rassilon. Welcome to the Hellfrost. * Dozens of new Edges, including Disciple Edges for religious heroes. * Six alternative magical Arcane Backgrounds. * Details on 24 deities and their followers. * Rules for Glory, a new trait that measures the great deeds of your heroes. * Complete setting rules for adventuring in Rassilon. 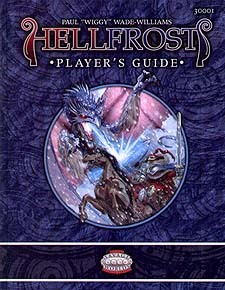 Hellfrost: Player's Guide is an epic fantasy setting for the award-winning Savage Worlds RPG.